Midsummer Ceilidh – On Saturday 11th June the Parent Council held a very successful ceilidh in the Community Hall. Primary and Secondary pupils performed while friends, family and visitors danced the evening away. Thanks to the Parent Council for providing a wonderful evening that included excellent entertainment and delicious food. Click here for a few photos. SQA Exams – The last of this session’s diet of exams took place on the 3rd June. Once again, the school would like to thank all the invigilators, led by our Chief Invigilator, Dr Hayes, for overseeing these so diligently and efficiently. This year had the added complication of some pupils in S4 sitting Chemistry and Gaelic on the same day. This led to exams from 08.45 to 17.20, a considerable period over which concentration was needed. We feel pupils coped well with this and, in general, with the exams but, as usual, we have to wait until the results come out in August for a true picture. Expressive Arts Day – P7 pupils came into the High School to spend a day working in the Art, Music and PE departments on 27th May. This year the theme was linked with the Comenius Project and focused on music and dance from our four partner countries – Italy, Greece, Latvia and Germany. Pupils worked in groups with Ms. Hunter and Mrs. Johnston to learn two of these dances each and with Ms. Gulliver, made flags and other accessories in the national colours to use in the dances. By the end of the afternoon the P7s put on a short performance comprising of the four dances rounded off with a ‘Dashing White Sergeant’! The end of the performance, which was viewed by other pupils, showed all the dancers being draped and symbolically bound by a large European flag. Welcome Packs for P7 – The current S1 spent a day making Welcome Packs for the new S1 class who will receive them in August. It was a good day, which saw pupils create colourful bookmarks, informative welcome booklets and humorous stickers. Although the P7’s have already been given lots of information to help the transition, this day gave the S1 pupils an opportunity to give information from a pupil point of view. Induction Days for P7 – Primary 7 pupils from the associated primaries attended High School on the 9th and 10th June. They followed a normal timetable to give them a flavour of school life after the holidays. Senior pupils supported them throughout the two days. P7 pupils received their High School ties from the Rector at assembly on the Friday. Click for photos. S4 Activity Week – Prior to starting their new courses, all S4 pupils were given the chance to sample a week of activities. Pupils were all challenged in a variety of ways thanks to a significant contribution from many staff. On Monday & Tuesday – our version of The Apprentice, Wednesday – Drama with Hayley Savage from Eden Court, Hillwalking & Gardening (in the rain), Thursday – Fishing, Kayaking, Cycling, Drama and on Friday – Scrambling, Comenius, Photography, Kayaking and Rugby. Malawi Link – We have heard that Gairloch High School and Mlozi LEA School have jointly been awarded a Global Curriculum Project grant by Global School Partnerships. This grant is for developing joint curricular projects, and allows for further reciprocal visits to take place between the schools. In Gairloch High School, some of this work will be done through the new global citizenship course, World Class, being developed with S2. Initially awarded for one year, there is the potential for it to be renewed for a further two years after that. Junior Maths Challenge – This is a UK wide event for pupils in S2 and younger. It consists of 25 demanding non-calculator multiple-choice problem solving questions that require to be completed within an hour under test conditions. The questions get harder as the paper progresses. A gold certificate is only awarded to approximately the top 6% of all participators, silver to the next 13% and bronze to the next 21%. Well done to all! Bronze awards – James Aaron, Siobhan Vickerstaff, Ciaran Alexander, Kenneth MacKenzie, Louis Stein, Justin Claydon & Catherine Wyatt. Here are two examples taken from the middle of the paper. Q: What is the smallest possible difference between two different nine digit integers, each of which includes all of the digits 1 to 9? Q: What is the mean of 2/3 and 4/9? Basketball Coaching Qualification – David Gorman has just gained his UKCC level 1 basketball coaching qualification. This was gained during a weekend course in Inverness in addition to working in school with junior PE classes. This allows David to be an assistant coach at club level. He will be helping with basketball activities in school. David expressed his thanks to Mrs. Hildrey for her support. U13’s Scotland Basketball Team Trial – At the end of August 2010, S1 pupil Jordan Gorman travelled to Inverness to take part in trials for the U14’s Highland Basketball Team. Jordan was successful and was invited to play for the Highland Eagles. At the trials Basketball Scotland coaches were on the lookout for players for the Talent Development Programme. Jordan has spent the last 10 months travelling to Inverness twice weekly for training for Highland Eagles. He has played, in the Highland Super League, West of Scotland League and Basketball Scotland’s National U14’s Tournament. As a result of his hard work Jordan was invited to try out for Scotland’s U13’s Basketball Team on Saturday 11th June in Stirling. Fifty-one U13 players from all over Scotland have been invited to try out for a squad of 12 plus 3 reserves. We wish hime well and will keep you updated on progress! Undergraduate Talent Scholarship – The University of Glasgow’s Talent Scholarship supports new first year students from the UK who have shown excellent academic achievement before starting University. Sophie Donald applied for this Scholarship and we have heard that she had been successful. She will be studying German and Music at Glasgow. Former Pupil Success – Flora Donald has been awarded a BSc First Class Honours in Plant & Soil Science from University of Aberdeen. We have also heard that Rachael Thomas has achieved a First Class Honours Degree in painting from Edinburgh School of Art. Congratulations to both! We have had confirmation from Highland Council that Gold Duke of Edinburgh’s Awards have been awarded to Liam Ross and Roxanne Ramsay. Their names will now be added to the Honours Board in the school. Well done to both! Important Dates – click here! 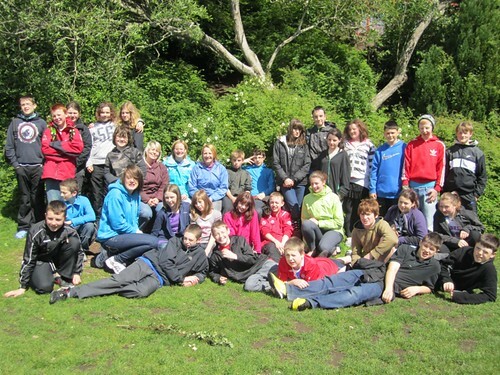 S1 Nethybridge – On 16th May S1 left for Nethy Bridge on two minibuses with staff in assorted other vehicles! When we arrived in Aviemore we went on an RSPB trail with RSPB Officers, Paul and Kat. After the RSPB walk we went back to the house for dinner. The food at Nethy was great and there was lots of it. Thanks to Susan and Mrs Fraser for all their hard work and smiles! Later on Monday night we went to the local park and played football and rounders, followed by pool, cards and table football. On Tuesday morning we had our fire drill and orienteering. 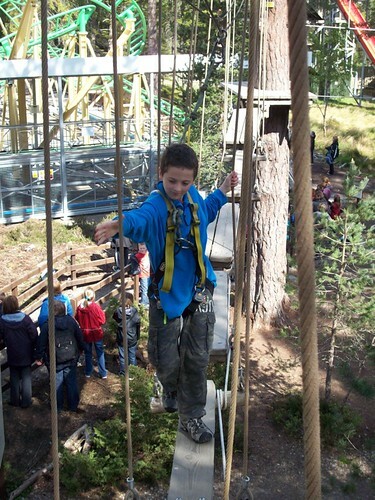 In the afternoon we went to our chosen activities of climbing, biking and walking. Lots of sore bottoms that night for the cyclists! Tuesday night we played games out on the field with Susan and the teachers. It was awesome! Wednesday was another day of chosen activities before room inspections, more games on the field and a quiz. Thursday was spent at Landmark. Lots of rides on the rollercoaster, water slides and the sky dive. We spent Thursday evening at Loch Morlich doing kayaking and canoeing. This was the best day of the week! On Friday we cleaned up and headed home. A great trip! S3 Activity Week – While S1 were at Nethy, all of S3 were working in their House Groups on a movie project based on supernatural myths of Wester Ross. Hayley Savage, visiting drama worker from Eden Court introduced the concept to the pupils on Monday morning before they went ‘on location’ at a rather damp and misty Slattadale, by Loch Maree. During the course of the day pupils found locations to film their short movie and then in the afternoon got into costumes to do it for real. The pupils then spent the next two and a half days editing their movies in computing. Those pupils who had expressed an interest in graphic design spent Friday working in the art department with Ms. Gulliver. Excitement and enjoyment reached a peak on Friday afternoon when the all the pupils were able to preview their movies on the ‘big screen’ in computing. Please visit the school website to see the movies. During the Activity Week the pupils also took part in iDiscover and received Emergency First Aid training. iDiscover Day 11 – With S1 away at Nethybridge, S3 pupils joined S2 for what was the last day of this series of experiences. Some pupils were outside taking part in canoeing and climbing while others were at Flowerdale surveying the woodland there. Two groups remained in the school. One participated in a dance experience during which they created group dance routines. The other group used industry-standard equipment to record and edit a news bulletin. This day brings the year’s events to a close. The funding body, NESTA, will now analyse the whole project and determine how successful it has been in raising pupils’ awareness of innovation and how their skills have developed over the year. For more information on NESTA, go to www.nesta.org.uk or on idiscover, www.idiscover.org.uk. Click here to see photos of this day and others that have taken place. The school is grateful to have the opportunity to be involved in this pilot and thank NESTA and the providers for their contributions. Icebreaker Day – On Wednesday 25th May, all P7 pupils were in the High School for the first time as a future S1 class. Although they have all been together for many events already in P7, this was an opportunity for Mr Milner to put them out of their ‘comfort zone’ and make them work with fellow pupils from different schools. By interviewing each other and reporting back to the class their findings, they eventually began to feel more comfortable working as a whole. In the afternoon, the Science Department was the focus for all sorts of fun activities. McRobert Cup – Congratulations to the 18 S1/2 basketball and football players who travelled through to Dingwall to represent the school in the Ross-shire round of the McRobert Cup, accompanied by Dr Shearer and Mr. Johnston. The boys’ football team won against Fortrose, drew against Alness and a strong Invergordon side but lost to Dingwall. They played well but won’t go on to the Highland final in June. Thanks to David Gorman for organising the team and coaching during the games. The girls’ basketball team lost both their matches against Fortrose and Dingwall but made a fight of it in their second game, scoring more baskets and being much more aggressive. The boys’ basketball team put on a really strong showing, convincingly defeating Fortrose, Dingwall, and Alness. We go through to the Highland final on Friday 24th June and, on current form, who knows what might happen? Culture Club – Another smaller-than-usual group went to Inverness to see the BBC Scottish Symphony Orchestra perform at Eden Court. The programme included symphonies by Prokofiev and Beethoven and some arias by Handel, Mozart, Britten and Rossini. The music was wonderful and was enhanced by a pre-performance talk which took the form of an informal chat between the conductor, Henk Neven, and one of the principal cello players. The next trip is on 10th June to see Scottish Opera perform Verdi’s ‘Rigoletto’. Parent Council Ceilidh – This fund raising Ceilidh will take place in the Community Centre on June 11th between 7pm and 10.30pm. Details here.